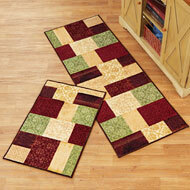 Decorative Floor Mats & Rugs | Collections Etc. 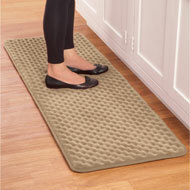 Almost any room can benefit from the right floor mat. These simple home accessories are a fun way to protect your floor while giving the area some added style. If you’ve been looking for a way to dress up your space, our assortment is full of area rugs and floor mats for the house that will give it a whole new look. 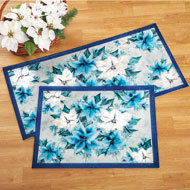 These decorative floor mats make it easier to enjoy gorgeous decor at an affordable price. We have all sorts of rug and mat styles in stock — and new ones arrive every week. 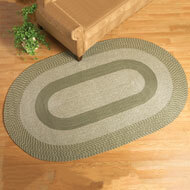 Our accent rugs come in sizes and shapes for every room in the house. Order rectangular living room rugs, small laundry room mats, L-shaped kitchen corner mats and other designs to fit your space perfectly. We offer a variety of braided area rugs and throw rugs to comfort your feet plus long carpet runners to reduce slipping in hallways. Collections Etc. will help you greet guests as well with outdoor welcome mats that come with a festive pattern or fun message. But style is just as important as functionality when it comes to floor mats. With dozens of collections to choose from, we’re sure there’s a rug style here that speaks to you. Our Christmas floor mat sets will get everyone into the holiday spirit with snowmen, trees, winter birds and even “Santa cats”. Other popular themes include our woodland and country rugs, coastal mats, southwest prints and floral floor throws. Everyone in your family will love the colorful floor mats you found at Collections Etc, even pets love them! We’ve been offering the best mats and rugs directly to customers since 1997, many of which you won’t find anywhere else. Begin your search today for a unique mat that will tie your space together.